Create a winning brand strategy with a quality branding questionnaire. 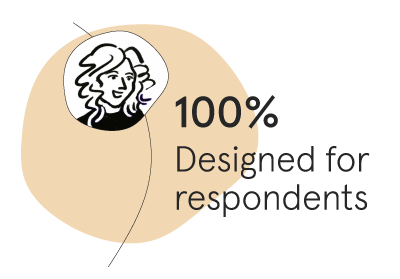 Learn how Prof. Elizabeth Stokoe helped optimize this template for respondents. Engage clients with an engaging branding survey that keeps them focused from start to submit. Make your survey match your brand. Instantly customize the font, images, colors, and more. No matter how many leads you get, we have you covered with free, unlimited questions and surveys. How do I start building a brand? Start with your core identity. Why does your company exist? That will reveal your overarching purpose. Refer to this when times are tough. Next, jot down your values. What principles are you working by? Then ask, what problem do you solve? How will you solve it? That will reveal your mission. Finally, what does the future of your company look like? What is it accomplishing? What is it known for? Those questions should reveal your vision. Once your core identity starts to form, you can figure out what story you want to tell. Remember. The story is about them, not you. Make your audience the hero, tell a great story, and your brand will stick. How do I develop a brand strategy? A brand is what others think of you—not what you think of yourself or even what you want others to think of you. A brand is not what the company does, but more about what your market thinks of you. So your strategy must begin by asking, “How do I want others to perceive me?” Even if you can’t control how others think of you, your goal is to influence their thinking. So start with your product. Did you make something remarkable? What does your audience care most about? What progress are they trying to make by using your product? Then tell the story of how your audience triumphs, over and over again. Why is building a brand important? Human beings are storytelling creatures. We gravitate toward memorable stories, especially when they involve us. Your product or service plays a role in someone’s life, but you influence how important that role is by the story you tell—that story becomes your brand. Nike sells shoes, a commodity by many standards. But the story they tell converts that commodity into a brand. Remember this: shoes wither and die, but a story lives on. Your brand is only as good as the story you tell. And the story you tell is only as good as the product you sell. So get asking people what they think—send out a questionnaire. How do I brand my company? Your market decides if you’re worthy of a brand or whether you’re just another product they’ll use until something better comes along. Your job is to focus on positioning. You can position your product in such a way to deliver maximum value to your market. This includes the story you tell, your identifying logo or mark, how well your product or service performs, and how well you support customers in reaching their goals. The better you do this, the more different you are from your competitors, and the more consistent you are, the more likely a customer will elevate your status from ‘just another product I use’ to a trusted brand.